NASA Earth Observatory image by Jesse Allen, using VIIRS day-night band data from the Suomi National Polar-orbiting Partnership. Suomi NPP is the result of a partnership between NASA, the National Oceanic and Atmospheric Administration, and the Department of Defense. Caption by Kasha Patel and Adam Voiland. Even Earth’s skies were celebrating St. Patrick’s Day this year. On March 17, 2015, a severe geomagnetic storm—the strongest of the past decade—painted the sky with green, red, and blue auroras from New Zealand to Alaska. The storm conditions provided a fantastic opportunity for aurora viewing from above and below. On Sunday, March 15, a coronal mass ejection exploded off the Sun towards Earth, as observed by NASA and National Oceanic and Atmospheric Administration (NOAA) instruments. By March 17, the burst of solar particles and energy reached Earth and kept the solar wind stream at potent levels for more than 24 hours. The storm reached a G4 or “severe” level on NOAA’s geomagnetic storm scale, and the Kp index—a metric for global geomagnetic storm activity—fluctuated between 6 to 8 on a scale that goes to 9. The “northern lights” reached as far south as the central and southern United States. People first started reporting aurora sightings on Twitter from Colorado, Alaska, New Zealand and Australia. The storm’s peak intensity occurred during daylight hours in the Western Hemisphere, but aurora hunters in some regions still experienced a vibrant display at nightfall. 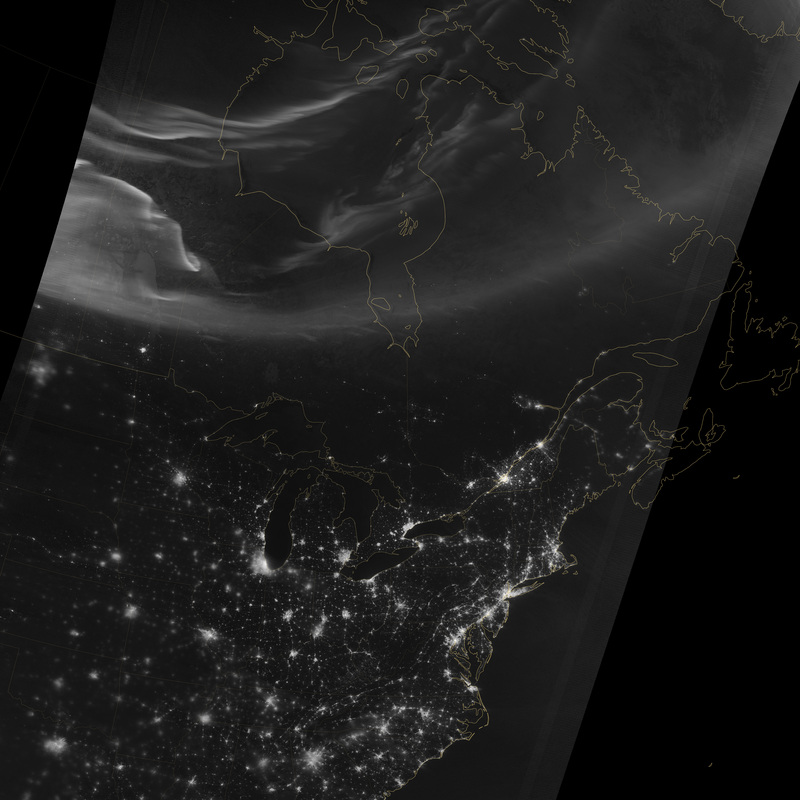 Using the “day-night band” (DNB) of the Visible Infrared Imaging Radiometer Suite (VIIRS), the Suomi NPP satellite acquired this view (above) of the aurora borealis around 1:30 a.m. Eastern Daylight Time on March 18, 2015. 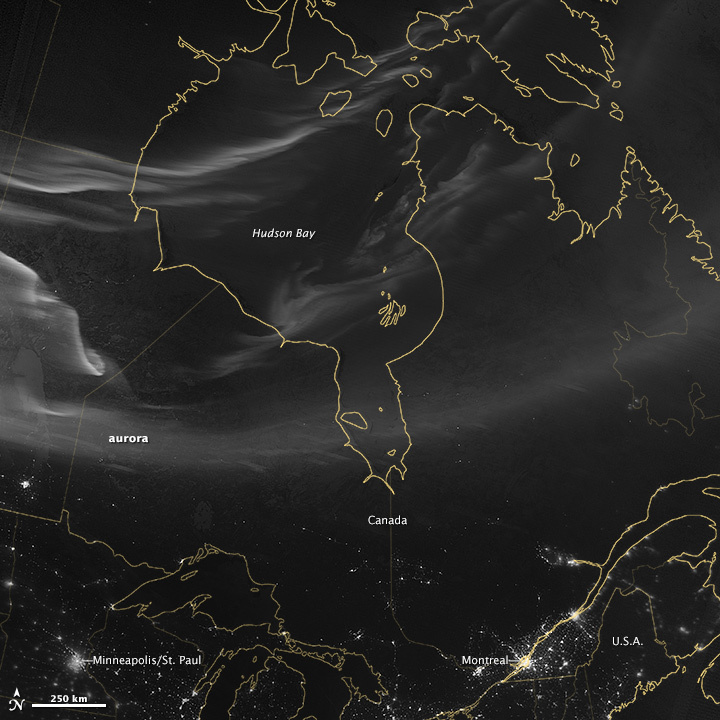 Auroras appear as white streaks over Hudson Bay, southern Canada, and the northern United States. The DNB sensor detects dim light signals such as auroras, airglow, gas flares, city lights, and reflected moonlight. In the image above, the sensor detected visible light emissions as energetic particles rained down from Earth’s magnetosphere into the gases of the upper atmosphere. While Suomi NPP was observing from above, skywatchers on the ground captured some spectacular views (below). 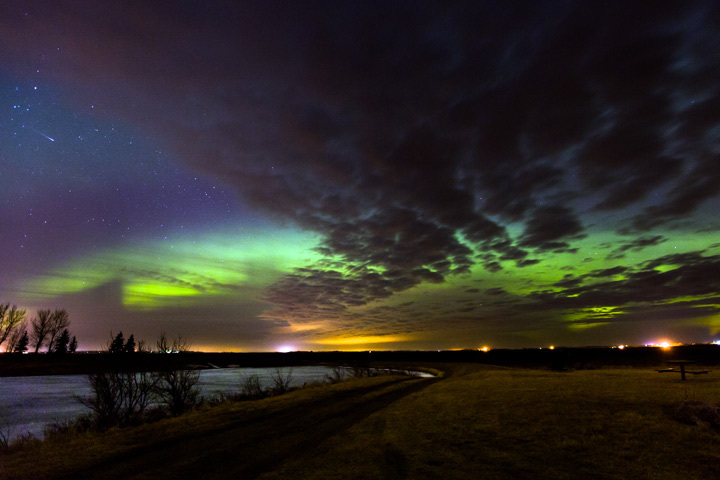 The first photo was taken by Chris Ratzlaff from Olds, Alberta, after sunset on March 17. The second was taken by Derick Wilson earlier that day (3 a.m. local time) in Paradox Valley, Colorado. The third image was captured by Janin Ober, who spotted the aurora on March 18 from Brandenburg, Germany. The images were submitted through a project called Aurorasaurus, one of the first citizen science efforts focused on the northern lights. 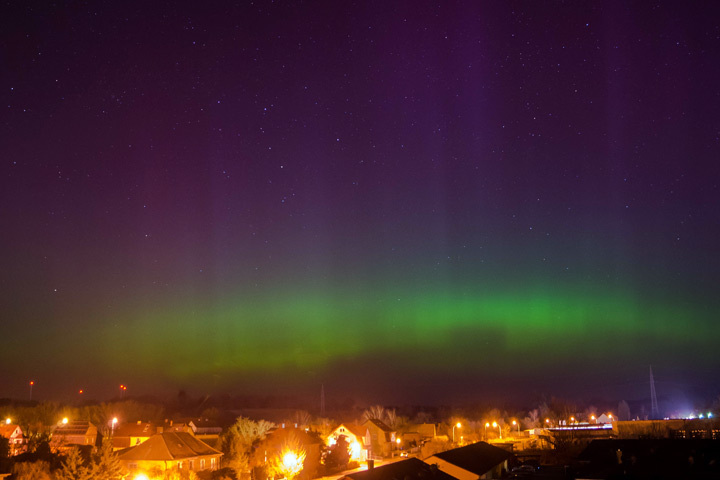 It is designed to improve a person’s chance of seeing the aurora by collecting and sharing observations reported via Twitter, the project’s website, and iOS and Android apps. For instance, Aurorasaurus has an algorithm that scrapes Twitter for aurora borealis and aurora australis reports. The project assembles those tweets and reports in real-time and places them on a map, along with information about cloud cover and the extent of the auroral oval—the region centered around each Pole where the aurora is estimated to be visible. For the Saint Patrick’s Day storm, Aurorasaurus gathered 35,000 aurora-related tweets and reports, and users verified more than 250 of them as positive sightings. The project sent more 361 real-time notifications alerting users that an aurora might be visible near them. The project intends to use the citizen science observations as “ground truth” for improving auroral oval models. Aurorasaurus is a research project supported by the National Science Foundation and designed by researchers from the New Mexico Consortium, NASA, Pennsylvania State University, and Science Education Solutions. Miller, Steven D. et al (2012, September 25) Suomi satellite brings to light a unique frontier of nighttime environmental sensing capabilities. Proceedings of the National Academy of Sciences, Volume 109, Number 39, 15706–15711. 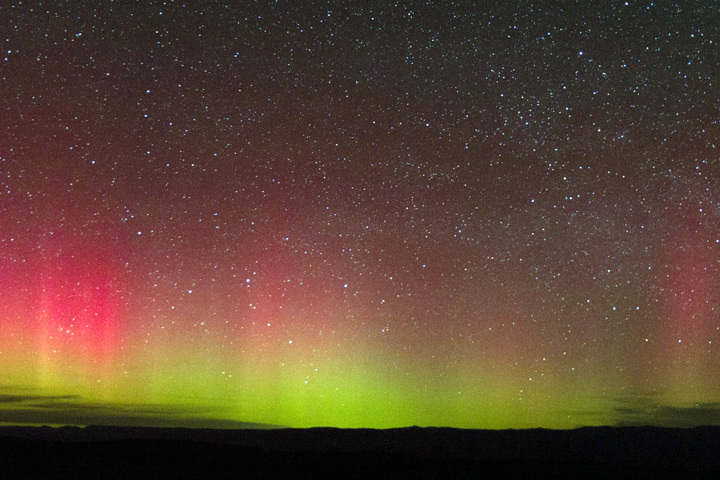 National Geographic (2015, March 17) Solar Storm Could Dye Skies Green For St. Patrick’s Day. Accessed March 20, 2015. NASA (2002) Aurora: fabled glowing lights of the Sun-Earth Connection. (PDF) Accessed March 20, 2015. NASA Earth Observatory (2011, September 27) Fires in the Sky and On the Ground.